Magic: The Gathering (MTG; also known as Magic) is the first trading card game, created by Richard Garfield and introduced in 1993 by Wizards of the Coast. 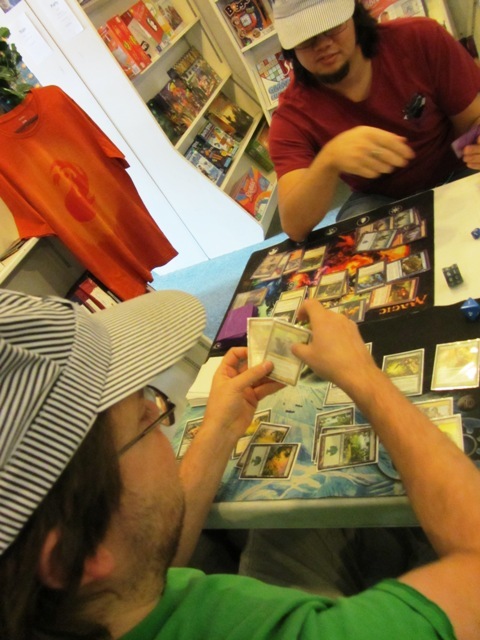 Magic continues to thrive, with approximately twelve million players as of 2011. 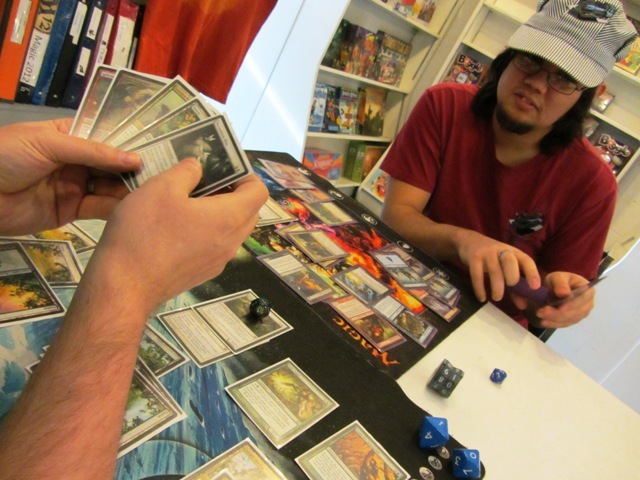 Magic can be played by two or more players each using a deck of printed cards or a deck of virtual cards through the Internet-based Magic: The Gathering Online or third-party programs. complex rules than many other card games. 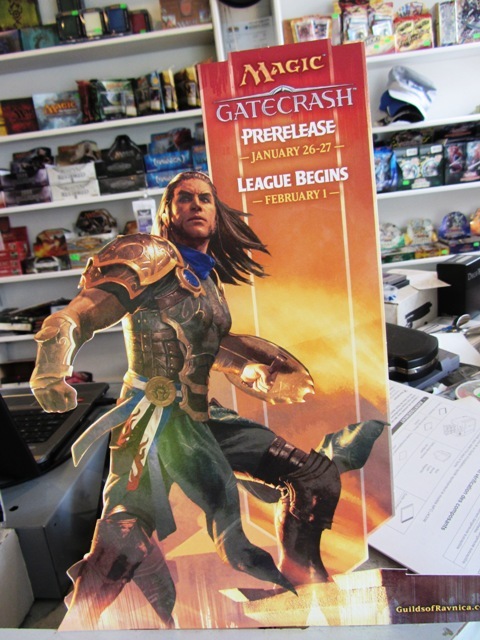 An organized tournament system and a community of professional Magic players has developed, as has a secondary market for Magic cards. Magic cards can be valuable due to their rarity and utility in game play. loses if he or she must draw from an empty deck (called the "library" during the game), or if they have acquired 10 "poison counters". In addition, some cards specify other ways to win or lose the game. 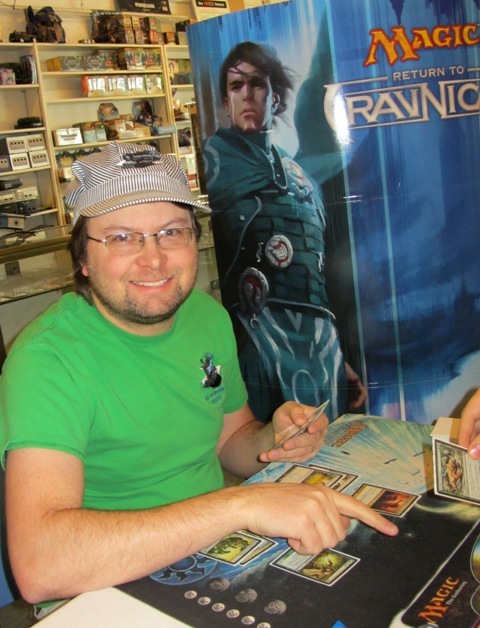 Players begin the game by shuffling their decks and then drawing seven cards. Players also draw one card at the beginning of each of their turns, except the first player on their first turn. Players take turns consisting of several phases. Certain cards can only be played during certain phases or during the player's own turn, and the player whose turn it is has the first chance to play cards. At the end of a player's turn, if that player has more than seven cards in hand, the player discards until their hand contains seven cards. 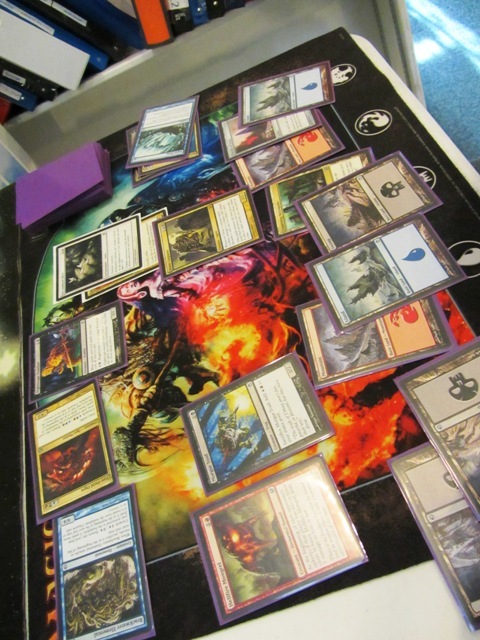 The contents of other players' decks and hands are not usually known to players. The two basic card types in Magic are "spells" and "lands". Lands provide "mana", or magical energy, which is used as magical fuel when the player attempts to cast spells. Players may only play one land per turn. More powerful spells generally cost more mana, so as the game progresses more mana becomes available, and the quantity and relative power of the spells played tends to increase. Some spells also require the payment of additional resources, such as cards in play or life points. Spells come in several varieties: "sorceries" and "instants" have a single, one-time effect before they go to the "graveyard" (discard pile); "enchantments" and "artifacts" are "permanents" that remain in play after being cast to provide a lasting magical effect; "creature" spells summon monsters that can attack and damage an opponent. The set Lorwyn introduced the new "planeswalker" card type, which represent powerful allies who fight with their own magic abilities depending on their loyalty to the player who summoned them. Spells can be of more than one type. For example, an "artifact creature" has all the benefits and drawbacks of being both an artifact and a creature.